As we all know, the economy problems have hit many families very hard. In talking with many pet owners, I have noticed that many families cannot afford to give proper heartworm medications to their dogs and cats. 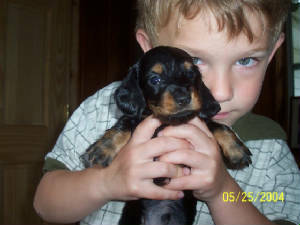 I am offering a new service at Jodachs Miniature Dachshunds where families can order their heartworm medications from us and I can mail it to you. This will save you from paying an office call to your vet and my prices are also cheaper then most vets offer them. CLICK HERE FOR MORE INFORMATION ON HEARTWORM MEDS AVAILABLE. PUPPIES AVAILABLE, Click on "available puppies" link on the left..
Before purchasing a puppy, it is very important to ask yourself some important questions. Am I home enough for a puppy? Can I afford to give my puppy proper nutritious food? Can I afford to bring my puppy to the vet if he/she became ill? What are some important qualities that I want in a puppy? Keep in mind the size of the puppy you are looking for in proportion to the size of your family members. Would you want a large dog if you have small children. Any type of puppy will jump up to be petted and may scratch or push a small child down if the puppy is too large. Every dog breeder has their own ideas about what is right and wrong, I can only tell you what my beliefs and goals are. I felt that there was a need for high quality, properly socialized dachshund puppies. What does socialized mean? Socialized can mean different things depending on the environment a puppy is raised in, so ask questions. 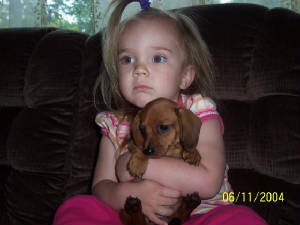 If a puppy is never around children, it is not socialized to children. All of my puppies are socialized to Children, Adults, Cats, outside play on grass and sidewalks, and inside play. All of my breeding females and males are from excellent bloodlines. I breed for myself first to try to produce the highest quality and most confirmationally correct dogs that I can so that they may be shown. The English Cream dachshunds have an extremely laid back temperament. Having them in the bloodline definately makes for better family pets. They are calm, happy, less "yippie", and less stranger agressive. Most of my dogs will greet strangers with a tail wag instead of a bark. They are all very happy and healthy. I do not believe in keeping dachshund adults or puppies outside as I believe that they are a lap dog and should not be exposed to extreme temperatures. My home is welcome to visitors, just email or call me to set up a time to come visit.